Live Creating Yourself. 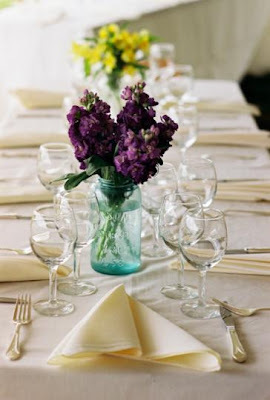 : Looks Like I Have a Wedding to Plan! Fantastic post! Can't wait to follow you as you plan the wedding! With your good taste, it's sure to be a beauty! Congrats to Andrea and Paul!!! Congrats to your sister! 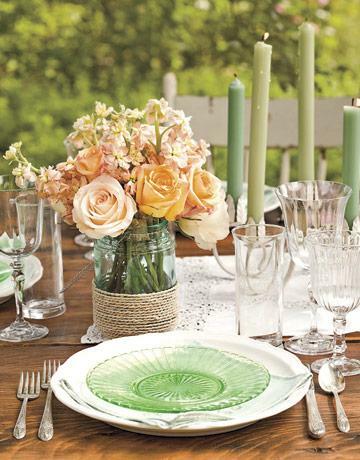 Love the centerpieces. I can't wait to hear more about the wedding planning! I was engaged and married in 4 months back in 1999 and everything was just perfect. It can be done! Best of luck and congratulations to your sister. Congrats! 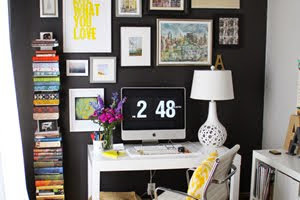 I love the inspiration and can't wait to see how it turns out!! Oh my gosh, July is QUICK, but I know you guys are going to plan something beautiful. Sounds like fun (albeit a bit stressful, right?!) I'm planning my own wedding and I have the help of my mother and friends but I'd sure be greatful to have a sister like you to do all that stuff and enjoy it! Congrats and have fun! I cannot believe you are pulling together a wedding in 3 months, I do not care HOW many people are attending...Which by the way, this intimate cozy affair sounds like a dream. Cannot WAIT to see the pictures, judging by the flowers it is going to be beautiful. Lucky sissy! You are a good sister!! 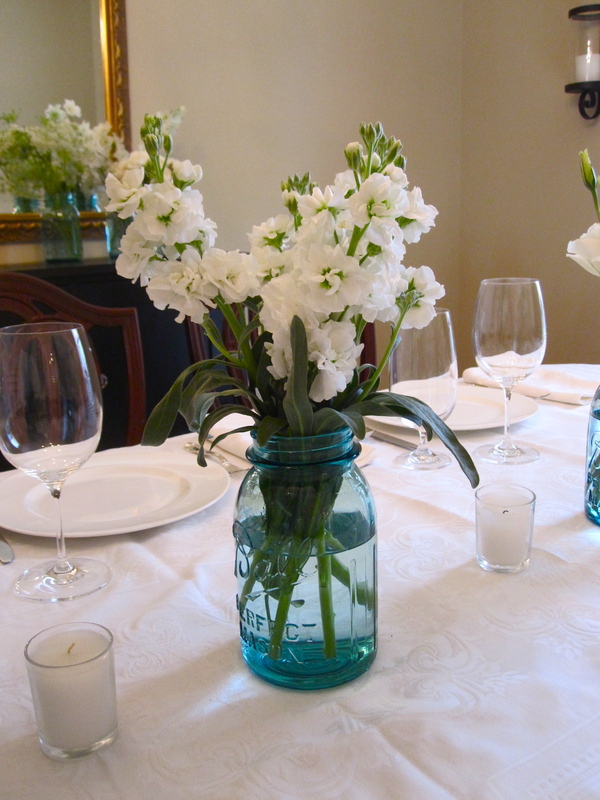 And I love the blue jars and white flowers. The centerpieces will be stunning. The flowers will be lovely, fitting for a beautiful bride. It's so much fun to help plan your wedding Andrea. absolutely stunning - flowers in mason jars (especially hydrangeas!) are a FAVORITE of mine! very much looking forward to what else you ladies come up with! We ordered our flowers from fiftyflowers.com and flowersandfreshness.com and did all the arranging ourselves. 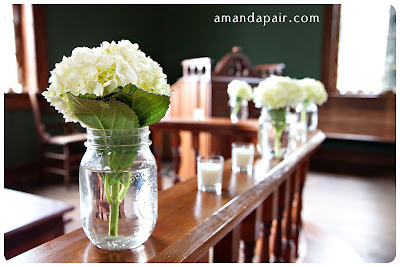 We used carnations because I loooove the papery look of their petals. They were amazing! And the service at those two sites is awesome! congrats to the bride and groom to be! Im sure you will do an amazing work!! 1000% sure!! Wow! What a wonderful and romantic idea! Go on with your bad self! Good luck! LOVE the white hydrangeas. 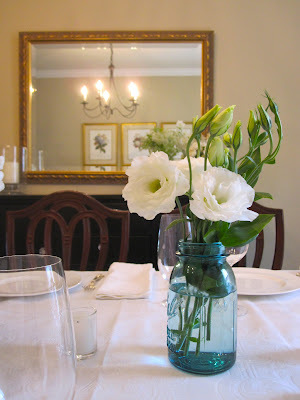 LOVE the blue mason jars. 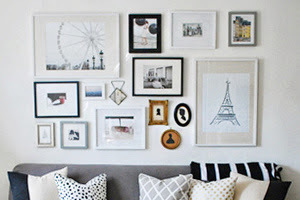 Love that the Kaz sister with a passion for this type of thing is leading the charge and documenting the planning. I assume Andrea will be channeling her creative strengths and putting together the music. Good luck! Can't wait to see how everything comes together. Wow, you're either insane, totally ambitious, or the most awesome sister in the world! I love the blue mason jars. I think the rope around the bottom of the jar would be awesome! 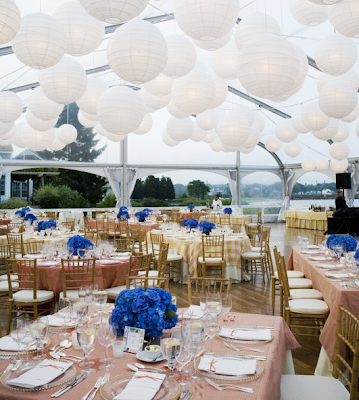 You may have a new career as a speedy wedding planner! 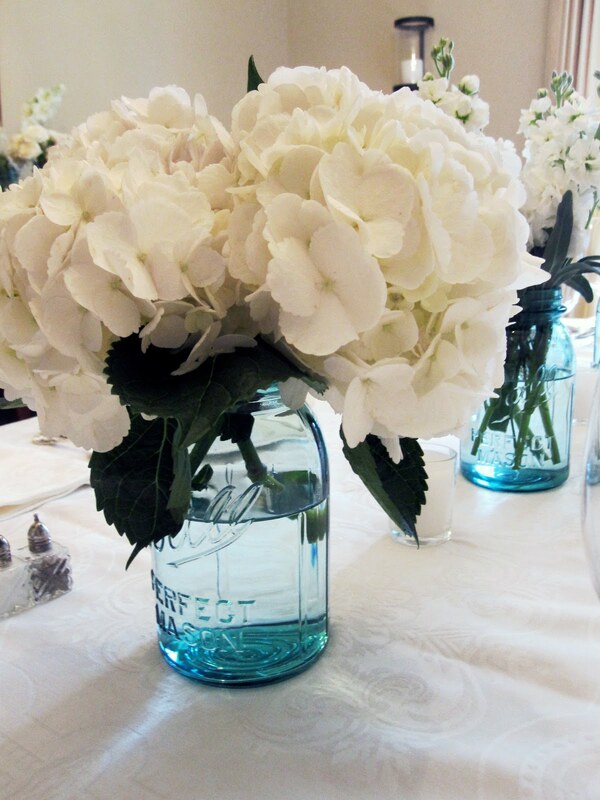 I love the blue jars with the hydrangeas. Perfect! PS--You and your sister look lots alike, from the photo at least. How exciting! I wish I had your help. 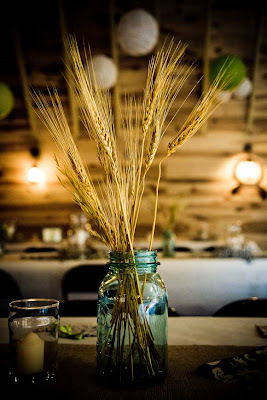 I love the look of the blue mason jars as centerpieces. The blue Hydrangeas are so gorgeous. Hydrangeas are my fav too! Congrats, I'm sure you will do an awesome job Alaina! Congrats to your sister. I am sure it will be an awesome wedding. 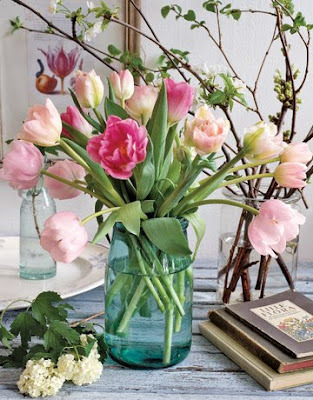 Love the flowers!! Congrats to your sis! How exciting! excited to see what you do! I'm sure it will be amazing.